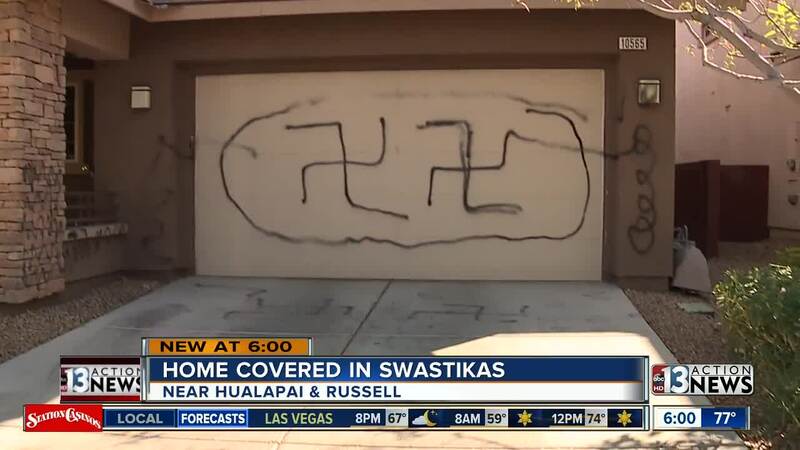 LAS VEGAS — Neighbors living in a southwest Las Vegas neighborhood were shocked to a see a home in their area vandalized with swastikas. Morley Fulgencio said he noticed the swastikas all over his garage, his driveway and the steps leading up to his front door when he was taking his daughter to school Thursday morning. "I was flabbergasted," Fulgencio said. After a short drive around the neighborhood, Fulgencio realized that only his house was the one vandalized. He said he has no idea why his home was singled out. Fulgencio said he hopes this was just a prank. Neighbors rallied together to show support, knocking on his door to help. Neighbor Brian Judd even arranged for crews to clean up the vandalism for free. Fulgencio says he's been overwhelmed by the support, and that it shows the idea of Vegas Strong. "It shows whatever hatred is out there, it's outweighed by human kindness," Fulgencio said. No one has been arrested, and the incident remains under investigation according to police.